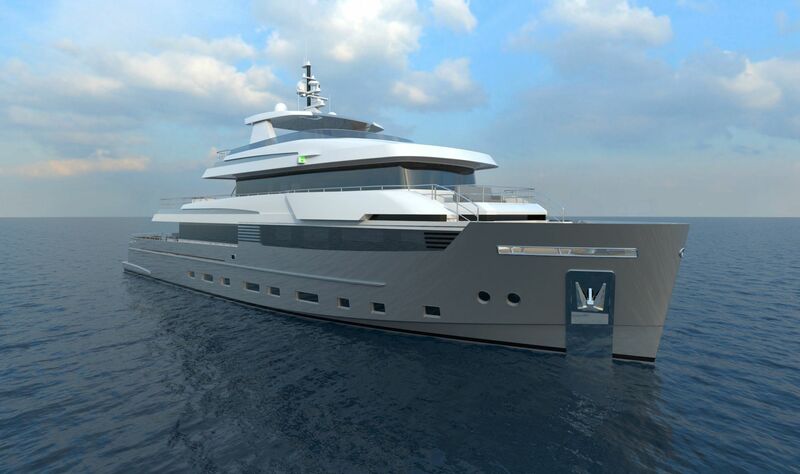 Cantiere delle Marche has signed a contract for the Explorer 40.22, a 40-metre ocean-going yacht designed by Tommaso Spadolini with naval architecture and engineering by Hydro Tec. First and foremost Explorer 40.22 has been designed to handle all weather conditions. Being an explorer yacht she has a very efficient, sea-kindly and sea-worthy hull form. Safety and comfort of guests and crew are at the forefront of her design. Another distinguishing feature of Explorer 40.22 comes with how far she can navigate without refuelling. Proven high-end equipment in a large and well laid out engine room designed for ease of service by crew is another fundamental feature of Explorer 40.22. Taking a look at both her exterior design and interior layout, it can be seen that the purpose of Explorer 40.22 is twofold. Firstly she offers comfortable cruising to her guests and secondly she allows exclusive and extended holidays ‘far from the madding crowd’. “I worked with this client many times in the past and two of his most recent yachts bring my signature,” says Florentine designer Tommaso Spadolini. “He asked me for a clean and simple silhouette and generous interior/exterior areas to provide him and his family plenty of spaces to spend long holidays in total relax. “The yacht will feature 7 guest suites, and 4 cabins for Captain and crew. All areas, both interior and exterior ones, both private and social, will pamper, delight and entertain all on board as they are on holiday,” says Spadolini. “The yacht has been designed to the standards set by a very experienced client who decided to switch from a planning yacht to a displacement one,” says Sergio Cutolo, founder and team leader at Hydro Tec. With a length overall of 42 metres and a beam of 8.50 metres, Explorer 40.22 will have a displacement at full load of approximately 400 tons. Powered by two Caterpillar C32 Acert delivering 970kW each at 2100rpm, Explorer 40.22 will reach a top speed of 14 knots with a range of 3500nm at 10 knots.